Following on our campaign against zebra crossings, we find ourselves forced to start new campaign "Save Double Parking!". The anti-car council has come out against double parking as being dangerous and anti social. Maybe but for residents is the only way to park a car after the morning school run, and for commuters, its the only way to park a car with all the legal spaces taken up by those selfish residents who don't drive to school or work, so freeing up spaces. Every cyclist who owns a car and goes round being smug, "I pay my road tax", is missing the point. The car they've paid the road tax for is on the road somewhere, that's the rectangle of tarmac they have rented, and by not using it they are inconveniencing not just the vehicles they hold up on their crawl round town, but those commuters who rely on the spaces they create. We don't normally cover double parking, and when we do we never name the roads. Those streets where you can get away with it are secrets we do not dare share, as then we will have nowhere to park. Certainly this road looked familiar. The buildings look Cliftony, possibly university area, the road is wide and quiet with an RV on the left, opposite a smartcar. Time to send a query off to our petabyte scale datacentre to see what shows up -and yes, we know this road. It's Belgrave Road, BS8. What's interesting about this road is why was it chosen? Did the council have to tip off the journalists that this road was trouble? Was in in fact staged purely to push out new CPZ/RPZ restrictions, our very own WMD-for-iraq claim? We have a theory there. Belgrave road is right next to the BBC. The journalists just popped out for 30 seconds to get a couple of pics and then went back in, job done. Of course, that does not mean that the photo was not staged. More research is needed. This is where our new experiment to instrument cyclists and pedestrians in the city has begun to pay off. By having them filming themselves, we can review exactly what they've done wrong, from their own position. This is a lot easier than filming them ourselves, as it is really hard to hold a camcorder steady while driving through Montpelier, especially when you are trying to text someone. We just let the bikes do the work, then later get the pics. Up until now most bike filming has been written by the cyclists, always whining about something or other, such as this Glaswegian Magnatom, who has taken up the classic sport of that city -starting fights with strangers- out of the bars, and onto the roads. We aren't like that. We will criticise the cyclists and any other tax-dodging subversives we see. Here then, is our ride-by of this road, where we can say that yes, it looks like a good place to double park. Nobody seems to mind, and it's handy for the BBC. This is important if you are Noel Edmonds, on a visit to the competition to see if your latest idea for a Saturday evening show has got any interest. The video was taken ten days ago, in term time, so if the council staged the entire double parking scene, they kept it up outside the BBC for a long time -it probably is genuine. At 0:06 a tax-dodging cyclist -correctly dressed in hi-viz and helmet- sticks her arm out to force a Mercedes to stop its manoeuvre, a turn into the bus lane. This was a premium car, and clearly belongs to someone important -possibly Noel Edmonds himself. All the cyclists should have given way, and not held up this car by being in front of them in the bus lane. At 0:31 we see a Vauxhall Zafira being forced to brake hard after overtaking the bicycle. Throughout the sequence, we see pedestrians crossing the road -only one of them is wearing hi-viz clothing. Event #3 concerns us, the car which has to put their foot down to swing past the bicycle, then cut in , apparently to double park right in front of them. If the cyclist had not been pootling up this double-parking-friendly road at 5 mph, the driver would not have been forced to take such action. It is not environmentally friendly having to accelerate and brake like this, showing that while bicycles themselves may not be polluting, they cause the other vehicles in the city to waste more fuel, to pollute the city more. We can see then, in 46 seconds, how a couple of bicycles can hold up the journey time of cars, be they important cars who need to use the Bus Lane, or merely someone who needs to double park outside the BBC offices. It is bad enough that these cyclists are allowed to do this, that they do not pay any tax, let alone compensate us for our lost time -now we see that the council is trying to take away our right to double park. Furthermore, the video showed how pedestrians, cyclists and even skateboarders are trying to take our roads away from us. We must resist! When will this anti-car oppression end! Again, we send our undercover cyclist and pedestrians into the city streets. Unlike in the Panorama documentary, we aren't going to make them do some in-mirror filming where they cry about the hard time they got -that's because we don't care about their feelings. Instead we just watch with bemusement. Here, then, is an evening crossing of Montpelier. The bike is apparently equipped with LED head lamps, though this doesn't show up well in the video. Fairfield Road, a zigzag on Richmond Road then a descent on York Road -with oncoming traffic- followed by a drop down Brook Hill and along Upper Cheltenham Place to join York Road again. What does show up is that there isn't much through traffic, and what there is gives way to the bicycle. It's hard to say that Bristol persecutes cyclists when every one of the approaching vehicles comes to a halt. The photographer claims that this is due to the fact that "My LED helmet lights cause physical pain to drivers I look at", which is something we aren't sure about, though it is certainly possible that they may be stopping because they can't actually tell that it is an oncoming bicycle. We would have to do some A/B testing with different lighting options to reach a conclusion. For now we shall just assume that in this city everyone is gracious to bicycles, even though they are clearly inappropriate for these narrow city streets. Note how at the end of the ride, the cyclist has the rudeness to tell off a car for driving round without lights. 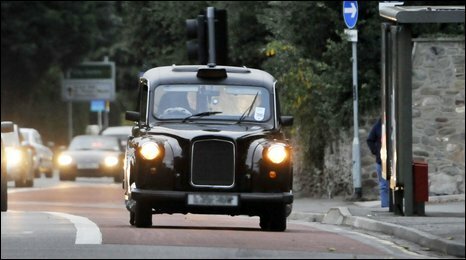 What's sauce for the goose is sauce for the gander we say, and if bicycles are going to nip round our streets without lights, not stopping at traffic lights or zebra crossings, then we car drivers should have the same privileges -and that includes the option of driving without lights. Its more environmentally friendly, you know. However, that's not what we really want to cover. What we do want to raise is that Montpelier is simply too narrow for cars to get past bicycles, and that Picton Street-York Road-Fairfield Road route is not some residential road, it is the primary rat-run of Montpelier, cutting out two sets of utterly needless traffic lights and two mini roundabouts. If you want to get from Stokes Croft to Ashley Down hill, you are in a hurry and you know the back roads, this is the secret route to take. Yet all it takes is one single bicycle and there's suddenly a tail back of traffic, and all that time advantage is lost. The cars parked on either side of the road are as far over as they can be, and now with the police sending them threatening letters, it's going to be hard for them to provide any passthrough space for bicycles. Those drivers trying to use this route are important revenue earners for the city -pootling cyclists aren't. And independent of whether or not this area gets 20 mph zones, oncoming bicycles delay cars here, and that costs all those people money. Ban them from the main streets in Montpelier -give them the back roads- and all will be well. The secret back car park of UWE, the one known only to an elite few, has been taken away. How? 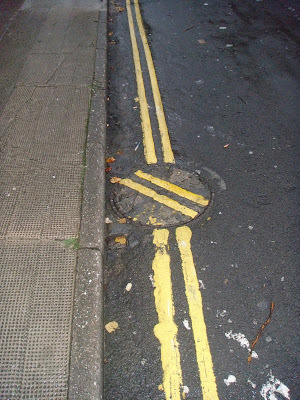 Double yellow lines! Fortunately, as the road is still private, it's not clear the lines are enforced. And you can always park up on the grass instead. A lot of people come to our sight looking for free Cabot Circus parking, but we haven't mentioned Primark yet, which is apparently so popular that people are selfishly parking at Cabot Circus and walking to Primark. This is wrong. Do these people not know that the Cabot Circus consortium invested a lot of money in that parking area, putting in high clearance parking for bigger vehicles, yet now it turns out that people are shopping elsewhere? Even though the parking spaces are now let out at weekends at discounted rates? We think that people who wish to shop at Primark should park elsewhere, and so are pleased to receive this photo from Cap'n Bikebeard showing a secret parking space? Where is it? Castle Park. And how exactly does this car get there? That's the secret. Just a quick note to say that the area in front of the Vaulted Chambers should not be being used for parking by anyone, including family members, friends etc. Please can you pass this on to anyone who may be parking here. In future any cars found parking here will be towed away. A lot of people complain that all we ever do is take photos of cars parked badly and make fun of them. Well, we don't actually make fun of them -we are praising their innovative solutions of the problem of how to park in the city, now that the council has taken anti-car actions such as adding a new 5000 car car park in the centre purely for shoppers. But we need to branch out, we need to raise the bar. And last week's coverage of Southmead shocked us. There were children: outside the house. Some of them on bicycles. None of them with helmets. Do they not know how dangerous this is? The BBC coverage has shown us that we need to do more, so we have secretly stuck some cameras on pedestrians and cyclists round the city, and are seeing what it is like from their eyes. This does not mean that we support walking or cycling around the city, only that we want to see what it is the troublemakers are whining about. We will interpret the videos as we see fit, not what our undercover camera crew thinks. Here is video #1, a pedestrian crossing whiteladies road at a zebra crossing. As you can see, the red car CH51RLY decides that it is too important to stop for the pedestrian and instead decides to drive straight over the crossing, 5cm away from the pedestrian. Is this wrong? Not at all! The driver clearly has to get to work, is probably tired and on the phone. Anyone would do the same thing. It's not as if they are running red light or anything! We don't understand why these pedestrian rights groups are whining about cars endangering their right to cross roads safely. They have no such right! And zebra crossings, just like traffic lights, create congestion. Imagine if the driver had had to stop here? an extra 15 seconds on their journey, right? Now scale that up to the number of zebra crossing and pelican crossing you might see on a commute in to work. At least ten more. That's three minutes of your commute time being spent waiting for pedestrians to toddle over. Of course the driver runs the lights -its the only way to keep the city moving. For this reason, Bristol Traffic is pleased to announce our new Campaign against Zebra Crossings. Every zebra crossing in the city creates congestion. Every zebra crossing says to pedestrians "It's OK, you should walk round Bristol", leading them to walk round the city, eventually having to cross roads that don't have zebra crossings -getting into accidents, and blaming us, the car driver! Join the Bristol Campaign Against Zebra Crossings today! We will print a manifesto in the week and ask all the parties and leading celebrities for their support! Sign up your support below! ﻿Here in St Andrews, we can see that WR56WHV clearly has a selfless owner. ﻿Not only have they parked their shiny car across the exit from the footpath between Effingham Road and Belmont Road but they have also taken the trouble to mount the pavement. Their careful positioning should prevent children, wheelchairs and buggies coming out too fast onto Belmont Road; in fact he should prevent buggies coming out at all. The whole zig-zag parking area is trouble in our city. In theory: anyone parking there is wilfully endangering pedestrian lives. In practise, as even the nearby double yellow lined areas are full of short-stay shoppers, zebra crossings are the only place to stop. How to do this without endangering pedestrians. 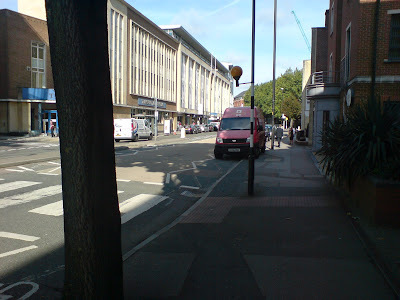 This photo, from Southville Parking, shows an experimental delivery zone in Victoria Street. The zig-zag area has been moved leftwards, with some bicycles painted down to force bicycles out the way of through traffic. This newly opened up area does not have double yellow lines, so delivery vehicles -here BX06MDU from the Post Office- have a convenient place to stop without endangering pedestrians by parking over zig-zags. Just moments after recording the appalling Jay Walking incident in Bristol's famous Gloucester Road, our roaming reporter managed to snap this incredible photo of a new mode of transport. Our team of investigative journalists tell us this vehicle was developed in secret by the CIA in collaboration with Firstbus, and that this is the new hybrid "Manvan" (tm). We're not so sure. However, this radical new vehicle (part human, part cabriolet, part something else) could be the solution to all our urban traffic problems and the ultimate transport salvation of inner city Bristol. Half Man, Half Car. Genius. Early adopters 'Trade Link Retail Services" are seen here testing the concept on an ASL on Gloucester Road, probably because the vehicle is, at this early stage of development, apparently only pedal-powered (for legal reasons). But... a wider roll-out is expected next year following further testing of the prototypes. If the extensive trials currently taking place on Bristol's red tarmac prove successful a motorised version of this van, and even cars, buses and lorries, may then become upgrade options. SPOF: Single Point of Failure. The failure modes of GPS are pretty fascinating, which is why you cannot trust it to get you home alive, not unless you are in the US army and have access to the military GPS channels. Even then, you can't trust them past the opening salvo of a war that involves non-conventional armaments. The Bristol Traffic Project is not anti-car, but we are anti unscientific approaches to the traffic issues of our city. Therefore it was with some sadness that one member of the team was forced to issue a complaint about a recent advert. For anyone else who fears that SatNav is not something that should be relied on, consider complaining to the Advertising Standards Authority. There is no need to go to such detail, a more succint summary would be "If GPS is so reliable, how come come someone nearly drove their BMW off a cliff last summer? (Apologies for the citation style, but it was needed for the ASA complaint form). Plain text only. FirstBus would like to make clear that this footage of a bus failing to observe rights of way rules is not one of theirs. All their buses respect zebra crossings as well as Advanced Stop Lanes for bicycles.Furthermore, anyone who states otherwise will receive an injunction from some well-known libel lawyers to prevent them spreading such lies. In our Friday Brain Teaser, some people commented on the no-entry signs at the entrance. These people need to get a newly-updated "Bristol Highway Code" document, which will bring them up to date with recent changes in the meaning of signs. For the particular Red Circle with White Minus, it's severity has been downgraded. The vehicle heading down Marlborough Hill, WR09FRJ is adhering to the new signage, as the brake lights show that they are slowing down on entering the one-way system from the low-priority entrance. Bristol Traffic welcomes contributions showing this sign's new meaning being followed, as well as other recent changes in the meaning of other signs. It's not just the cyclists on the pavement, now it's the pedestrians in the road! Look at this clown: apparently unable to use the proper crossing, he's also on a mobile phone whilst using the road (that's illegal isn't it?). 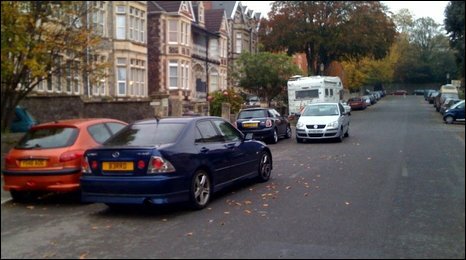 It's nice to see that the Shared Use area is being used effectively on Cotham Road, now that term time is started. It can be used by parents dropping their kids off at the Steiner School. We have seen them argue with Parking Services whenever an attempt is made to discourage this, and clearly this term BPS are avoiding the area, so helping harmony develop. What happens when buses come, cynical viewers may ask? That's simple, they just double park in front of the commuters, just above the build-out indented to help pedestrians to cross. This shows how a mixed use: school-run-parent and bus parking area can actually enhance all school transportation options. The new entrance to the new Hartcliffe Education Campus. Or is it? In the first of an (occasional) series of brain stimulating posts we ask our many readers to spot any problem(s). No prizes, just kudos. The quantum physicist and Manhattan Project veteran, Richard Feynman, in his seminal 1959 talk "there's plenty of room at the bottom", the talk that gave birth to the concept of Nanotechnology, offered two prizes. The one for an electric motor less than 1/64 of an inch was won within a year, but the other -"take the information on the page of a book and put it on an area 1/25,000 smaller in linear scale" wasn't achieved until the mid 1980s, when some PhD student took time off their thesis to use the Scanning Tunneling Electron Microscope to lay down a bit of Dickens in very few atoms. There are some interesting lessons there. One: any technology which can be defeated by a skilled person with access to electron microscopes or similar technology only needs an investment of slightly more than the hourly income of a PhD student with access to the aforesaid technology. If the person with the 4am shift on "The Beam" or "The Facility" earns $10/hour, you only need to pay $20/hour for them and the machine time. Make the problem more interesting than a thesis and they may do it for free. Two: really interesting awards take a while to be earned. We are reminded of this by a comment by Old Holborn on our this site is not a spoof posting, a comment that provided hard proof that Noel Edmonds is still alive, and driving round the bus lanes in a car that is not an official Bristol taxi. Having got over the shock of Noel E's continued existence, we think this is good. It ensures that all of us tax payers -including payers of TV license fees- are not held up by Noel Edmond in the taxpaying lanes of our streets. It also ensures that Noel has a future career, with the main capital investment -the motor- out of the way. But it does worry us that we have another Tier-2 TV personality on our streets to deal with, and it reminds us of our challenge to readers from the spring: to find a photo of Carol Voerderman taking full advantage of our city's parking opportunities. The thought that our regional champion of unrestricted parking is now joined by a Noel Edmonds' one-man stand against bus-lanes chills us. How long before the entire daytime-TV-presenter portfolio of the South-West ends up on our streets, in our bus-lanes, parking on our zebra-crossings with the hazard lights on? Someone needs to monitor this, and as the data-driven, evidence-based, metrics-centric traffic monitoring site of Bristol, the job falls to us and our many correspondents. We have already been looking for a photo of Carol V., now we are creating the Official Bristol-Traffic-TV-hasbeen-Award. We will buy a pint of beer from the Cornubia pub (maximum price £3) to whoever sends to bristol.traffic at gmail dot com new photos of Carol or Noel pootling round the city. For Noel, we will double this to two pints of beer (maximum total price £6) if they bring his fake taxi's wing-mirror (which must have been detached from the vehicle on the road, not while parked). We will issue an award of equivalent value if you can get a video of Noel getting really frustrated at the bike in front of his fake taxi pootling along at 10 mph in the bus lane. If he goes over into road-rage, we will not award anything, as we do not endorse violence. However, if Noel Edmonds does end up being put away for a number of years from a road-rage we will at least celebrate his absence from the second-tier sky and freeview channels. There is no hard deadline for the submissions; the award will be issued once the criteria has been met. However, the ceremony will be timed to be on the same date as a scheduled Bristol Cycling Campaign meeting (first Thursday of the month, apparently), so as to guarantee an audience. So let's keep an eye out there for Noel E in a taxi cab -it's worth beer! Some of the cyclist groups have discovered us - CTC Forum , citycycling, and YACF, whoever they are, and have been viewing our site, apparently concluding that it is some kind of spoof, that the text is somehow satirical. Not so. We document the transport options in an anti-car city. While some of it may appear satirical to tax-dodging cyclists, that is merely because their model of the world suffers from an invalid assumption: "bicycles are a rational form of transport for adults". This taints their entire view of the site -and of society as a whole. If Bristol Traffic is a spoof, then, by inference, TopGear, Jeremy Clarkson, and indeed, the entire Daily Telegraph and Daily Mail newspapers, would have to be viewed as some kind of spoof journalism put together by an anti-car news media. While we do consider the BBC to be anti-car, we do not consider the Daily Mail or Jeremy Clarkson to be fictional. Until such a time as their fictional nature can be proven, we wish to be referred to as Bristol's Pro-Car press. Of course, we are competing with the Bristol Evening Post for the honour of being the best traffic news outlet. Today we are at a disadvantage as they have discovered that Noel Edmonds drives a taxi down our bus lanes. We are very excited by this news and look forward to any photographs of Mr Edmonds learning a new career now that his TV career has collapsed. However, the fact that we are not a spoof makes it hard to link to other sites. The Association of British Drivers, for example. We agree with their anti-bike, anti-bus lane, anti-pedestrian stance, but the entire layout of the site, including colour scheme and use of Comic Sans MS font, spells out "spoof". We are doing more research there before coming down one way or the other. Another recent situation was a comment on our popular Fixed and Singlespeed in Bristol article, where some idiot asked for us to link to their site, despite the warning in our comments that anyone who attempts this will be ridiculed. I found your site from a Google alert for "travel accessories". As myblog has content related to this term and some of your content, I was wondering if you'd be interested in a blogroll link exchange (I link toyour site and you link to mine). Their web site is about cupholders. Now, how to view this? It's a spoof as who in their right minds would run a web site advocating better cup holders for commuters? They have mistaken our site as some kind of spoof and want to join in. They really are leading-edge advocates of superior in-vehicle cup-holding technology, and are trying to move up from being a bottom-tier player in google searches for cup holder by trying to get links from the planet's premier transport journalism sites -of which we are clearly one. If situation (1) holds -they are a spoof-, we must turn them down because we are in fact serious journalists. Also, their site isn't very funny. If situation (2) holds, they are serious, we have to turn them down for a separate reason, namely their site is shite and we understand how PageRank works. Google does not give web pages high placement in search queries based on the number of web pages that link to you -quantity-, but based on the ranking of those pages themselves -quality. Only links from other premier web sites -such as the Bristol Blogger- matter; links from web sites that come in on page 17 for searches for cup holder do not, and by linking to them without the nofollow tag, would only devalue our own ranking, for no tangible benefit. For people who want to know more about the problem of applying graph algorithms to internet-scale datasets can we recommend Graph Twiddling in a MapReduce World, by Jonathan Cohen, of the US National Security Agency. We are only prepared to discuss PageRank and hence web site linking with people who have read and understood this paper, as anything else would be a waste of our time. Thank your for your co-operation. Your civil rights will be restored once The Emergency is deemed over. 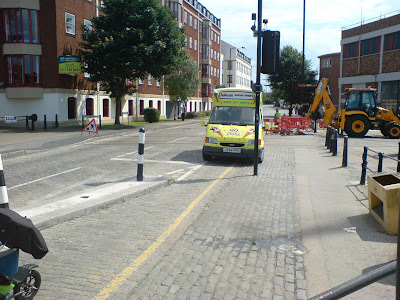 This is the Stokes Croft/Ashley Road junction, one where someone heading in the opposite direction went under a lorry, one of our correspondents heading north had a bit of an encounter with a driver apparently working for A&M Motors. Here, though, it's a peaceful evening. That's right. The cyclist on the left of the shot has cycled past the stop line on the ASL. This means that the FirstBus #73 bus will not be able to pull away from the lights first, and will instead get behind a slow moving bicycle. As this road is a showcase bus route, it is important to FirstBus that buses get priority over not just cars, but bicycles too. With heavy outbound traffic, only the bus lane will be free for the bus, and if the bicycles get in the way they will force the bus down to their speeds. If the bicycles respected the bicycle zone of the ASL, they would be waiting behind the bus, but in front of the cars. This would give them a safe zone while not slowing down bus traffic. The parking of this vehicle may seem completely random, but as it has a disabled sticker it is allowed to park on double yellow lines. The only issue, then, is why WN07HCX is parked on Elm Lane, Redland at such an unusual angle. It may actually be intentional. By parking the way they have, passing vehicles can't tell whether or not the car is actually about to pull off without indicating, or is just parked at a random angle on the double yellow lines by the corner. You can't even be 100% sure there isn't a driver in there, not from this angle. This forces any experienced local driver to slow down and pass carefully, looking out for any sudden movements. As such, it is actually better at slowing down vehicles approaching the corner with Grove Road than the give-way signs themselves are - signs which used to historically mean "pause and look for passing vehicles" but which will, in the forthcoming 2010 Highway code, be changed to mean "stop texting for a moment". it also penalises anyone who is not paying attention to the curve of the road, by scraping bits off their vehicle. Again, this encourages attentiveness, and hence safer driving. This is Marlborough Hill, Kingsdown, the secret road through the BRI. The sign says "New Road Layout Ahead"
The changed layout was a narrowing of the road, so as to discourage cars from driving the wrong way down a one way street without noticing. It is based on two assumptions: the driver notices, and that the driver cares. For those drivers who do need to use this high-performance route from Kingsdown to Marlborough Street -and hence the M32- the main problem with this new road layout is that the road is now too narrow for you to squeeze past bicycles. Fortunately, it's a very steep hill and bicycles will be grateful for any excuse to rest. We have recently focused a little attention on those free-loading skateboarder types that imagine themselves above the law, but still have the temerity to use our streets and pavements. Unlike we motorists, they do not need a licence. Nor do users of wheeled shoes, either. Even worse, dog licences were abolished in 1987 in the UK. And not one of the main political parties sees the (long overdue if you ask me) necessity for the introduction of cycle licences. No wonder we motorists feel so persecuted! There's been some recent news reports about schools cutting back on outdoor trips due to excessive fears about child safety. We feel that this fear of danger from animals is misguided. Farms are no more dangerous than the city. 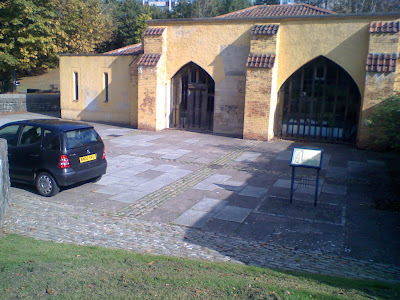 For example, the City Farm in St Werburgh's, is a nice safe place to run around, the only hard part is getting over Ashley Down road on foot from Montpelier. The solution is obvious: drive. Once there, it is no safer than walking round any part of the city. Full body armour will protect the small child from contact with animals. There is a small risk of having their fingers bitten off while a goat eats some grass. For this reason we recommend gloves. We are pleased to see that this one, on Fishponds road by Alcove Road, has been disabled. By not providing any promise that it will ever come back, or reason for the disabling, we hope pedestrians will be demoralised enough to consider driving instead. One of the big problems of the council is how to ensure safety of delivery van drivers. They have a hazardous life, always trying to find somewhere close to the dropoff point, always popping in and out of the drivers entrance to the vehicle, and often having to do this by stepping out onto the road round a van that is parked so as to destroy pedestrian visibility. Although they lack their own militant pressure group, we keep an eye on them and what measures could be taken to help make this town become "delivery van city"
By pulling onto the pavement the driver of YA55VDY was able to stop without inconveniencing any tax-payers, and unload their wares straight into the shop, before continuing on their way to their next destination. The only hard part of using this build-out was getting up onto the kerb, but by pulling onto the lowered crossing area at full speed, they were able to do this quite smoothly-once all the schoolkids and parents jumped out the way! If only the rest of the city provided such dedicated vehicle delivery facilities! We are still hoping that the police will do something about skateboarders in the city. We had high hopes for the Cotham police area, where the PACT priorities had considered this issue. Inconsiderate cycling and skateboarding on pavements within close proximity of Cotham Gardens causing damage and safety concerns to local residents. PC 1860 Harding to carry out a minimum of two patrols each week during school finishing times between 3pm and 4pm to give advice or enforce with tickets as appropriate. PC Harding and PCSO Horton to hold school assembly at Cotham School to promote safe cycling and personal responsibility. PC Harding to contact Bristol City Council Parks Department to discuss implementation or improvement of any existing facilities for cyclists/skateboarders. See that? Police to ticket skateboarders out on the pavements after school closing time and to turn up at assembly to promote personal responsibility. Finally, a police group representing the interests of us, the tax payer. We have footage of the three skateboarders in question, and will one day show our interview with these teenage criminals. Today we have some bad news. The police have changed their priorities. Vehicles routinely parking inconsiderately on the corner of junctions and in front of drop kerbs causing pedestrians, wheelchair users and people with pushchairs difficulty in passing, and obstructing the view to motorists attempting to negotiate such junctions. PC 1860 Harding and PCSO 9935 Horton to include specific area on daily `Patrol Plan` covering Warwick Road, Abbottsford Road and Cotham Gardens junction with Aberdeen Road, taking positive action against offending motorists by issuing `Fixed Penalty Notices` and vehicle `Tow Away` where deemed necessary. See that? No skateboarders, now it is us taxpayers, all of whom have legitimate reasons to park where we do -especially near the schools in the area. Indeed, it is threat of having our paveparked car scraped by the skateboarders that was our main reason to complain to the police in the first place, now they not only leave the skateboarders alone, they come after our cars. And what are the consequence of this change in policy? The tax-dodgers have come out of the side streets, and are now on the main through routes. This skateboarder is about to descend Cotham Brow, on the road. Not on the pavement where the criminals don't belong either, but here in the middle of the road. Our road. Holding up important people like the taxi that eventually manages to pass. Yes, he does it far more safely than the average Redland school mum, we are pleased to see -but he shouldn't have had to. There should not be any bicycles or skateboards on our streets. The only way to stop this getting worse is for everyone to attend their local Police PACT meeting, and make sure the local police focus on the real criminals -the cyclists and their fellow travellers, the skateboarders. Labour failed to grasp the nettle, although they did come up with one interesting idea. Maybe the Conservatives will see sense and pledge to ban cyclists from our roads. We know the bicycles in the city are lawless subsersives who deserved to be imprisioned. But exactly how lawless are they? Here: someone carefully pootling over the junction of Coldharbour and Cranbook Roads, no helmet, no hi-viz, bag dangling from the handlebars. At least those subsersives are going to kill themselves and any pedestrians they run into, so saving the NYPD the effort of shooting them. Again getting in the way of tax paying vans and taxis, as well as contraflowing one-way streets, but clearly cycling round the city like someone who has decided to commit suicide in London in a more interesting way than jumping under a tube train. Now look back at the first cyclist, the one quietly going across a suburban road on red? They're not in the same league are they? They think they are rebellious, but they are as rebellious as those swiss teenagers who put on freshly ironed Iron-Maiden T-shirts every day and come home by 9pm after telling their mum where they aer going to be. Our city's cyclists -they think they are rebels, but they are not. A few minutes after coming across a Kingsdown with cars, we we were shocked to discover St Andrews Road, Montpelier, had been completely closed to cars, so as to encourage walking and other non-tax-earning transport options. This is dangerous, as it will fail to give small children the appropriate fear of city streets which they need to survive. Still, it allows the locals to come out and talk to each other, and an opportunity to try walking on a newly uncovered pavement. Although if you look at these people, they're just, well, sitting, as if waiting for a car to come past. These living streets campaigners have to recognise, busier streets are more interesting. Continuing our popular series of how there are places abroad with ideas we should adopt in the city, we are pleased to send this lovely video of a policeman arresting some kids for skateboarding. Some people complain that we in this blog give skateboarders a hard time, but that's just because, like pedestrians, cyclists and horse riders, they slow us down and don't pay any road tax. We do try and attend PACT meetings and complain about skateboarders -more news on that another day- but we haven't ever seen a policeman in this city give teenage skateboard criminals the treatment they deserve. The photos have come back from Jessops at last, and one reveals a pic of the car driven by the Redland Mum that caused me so much vexation last Saturday that I had to have a little lie-down and a strong snifter. Yes, cyclists should be aware that this black Toyota Avensis FY58PVN, when driven by a woman with "no points after thirty years behind the wheel", may still cut you up to save one second off her drive home to the leafy Victorian suburb of Sustainable Redland. Cyclists should also be aware, if they swear at this motorist, she may tell you that she "has no time for people like you." But a different driver in a different car managed to mangle my bike and break my elbow very effectively last year, and I was in such shock that I didn't swear at him. So I swore at her instead. I have since washed my mouth out with soap. Apparently this is part of the council's new walking strategy. By making the crossing system more relaxed, the hope is pedestrians will run out in front of cars less often.